Hoping this finds you all well, and with fully tummies! I am slowly but surely working my way back into the kitchen. Isn't it ironic that I chose a time full of sweet treats? Yea, well, I can't help what my mind wants! 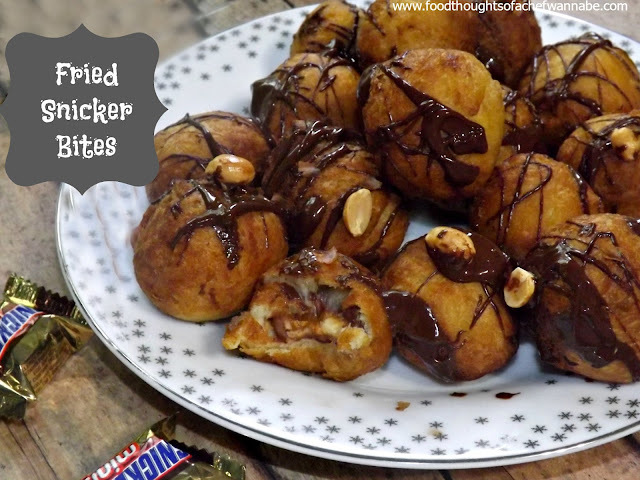 I was inspired to make these after hearing a friend back east eating a dougnut with a Snickers in the middle! I thought these would be easy, quick and freakin' awesome. In case you wondered....I was right on all 3 counts. Serve these warm, or room temp. Please try one while they are still warm though. You need to. It should literally be on your bucket list! Get about 2 inches of vegetable (or your oil of choice) in a medium pot. While it is coming up to temperature (350 degrees F) let's get going on the rest. Remove your crescent rolls from the container. Separate them out. Unwrap double the amount of Snicker bites as you have rolls as you will cut the rolls in half. Now take your rolls, cut into 2 pieces, a bit more on the pointed end, and put a Snicker bite onto each one. Pick it up and cover in the dough, roll in your hands until the ball is showing no chocolate and completely sealed, repeat with all of the ingredients. When your oil is up to temperature, fry about 4 at a time. It will literally take 30-60 seconds. I like to keep mine moving around with my spider while they fry. This helps them brown equally on all sides. Remove to a paper towel lined dish and get on with the next bath! This recipe is easily double, tripled or quadrupled. I drizzled mine with a bit of melted chocolate, and some peanuts, but feel free to hit them with some powdered sugar and call it a day!